It’s the quintessential American dream – a Fifth Avenue apartment; an enviable location on the museum mile; a bachelor from a prestigious American family as an owner. Plus, the fact is that the apartment in question is linked to one of the city’s most legendary figures. Indeed, there are few New York buildings as mysterious as 907 Fifth Avenue – the one-time home of copper heiress Huguette Clark. Although the reclusive Clark didn’t live in the three apartments she owned in the building for the last 20 years of her life, (choosing instead to live out the rest of her days in a hospital room), the residence has endured as an intriguing conundrum of the Upper East Side. Such an infamous history called for a certain standard in its makeover. A soothing and unique treatment, conducted at the hands of Jean-Louis Deniot, fit the proverbial bill. The award-winning 1916 edifice – an Italian Renaissance palazzo-style design conceived by J.E.R Carpenter for industrialist James A. Burden – was the first apartment block to replace one of the many private mansions, which originally lined the upper-class street before being converted into a co-op in 1955. Jean-Louis prescribed a “French [base] with an elegant American feel” throughout the apartment and “created the interior details from A to Z.” That A to Z runs the gamut from custom flooring and millwork (including geometric coffering) throughout to en-suite marble-clad baths and 21st century moulding profiles. The skillful interior architecture has been furnished with Jean-Louis’ perfected trifecta of custom, ready-made and vintage pieces, sourced from around Europe and America. In the hallway, the blending of old and new begins with the 18th century sharing the space with the 20th century and beyond. 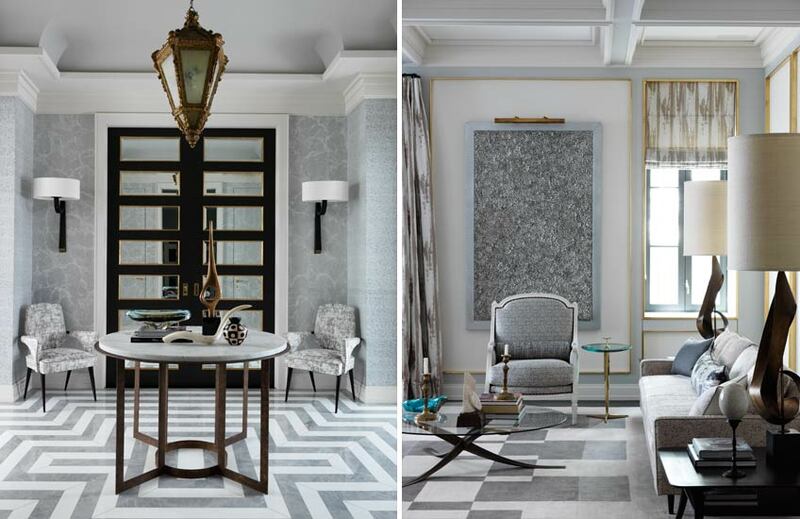 A pair of 1950s Italian armchairs sit elegantly at the master bedroom’s entry – a double ebony stained, bronze and antique mirror doors flanked by signature Jean-Louis additions, a pair of Herve Van Der Straeten sconces. A special Louis XVI carved, gilt wood lantern hangs directly above a circular marble and metal hallway table, situated in the centre of the geometric floor – a concentric design of blue Savoy and white Tassos marbles designed by Jean-Louis. Modern-day Fifth Avenue with a European flair is the result. 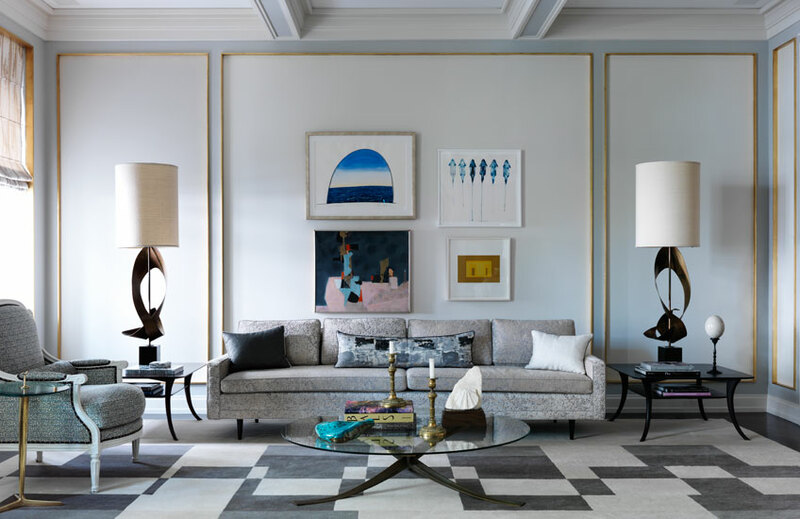 A proponent and master of Neoclassicism, Jean-Louis employs an unexpected modern take on the influential style with a palette of varying greys and neutrals in the living room where the look is anything but fanciful. “I love playing with layers of variations of finishes and contrasting techniques”, he explains, “All while respecting the layout’s flow ‎and feel. One room – specific finishes, specific story. I like to create an entire vocabulary that gets developed in various ways throughout the space.” The vocabulary of this home’s living room is one of subtle contrasts and an adept understanding of space. Elegant and offering a surprisingly modern aesthetic, a classic daybed by Jacques Adnet divides the room in two – its other half successfully maintaining a personality all of its own, simply united by the full-scale custom rug. Key pieces include two oversized Harry Balmer ‘Ribbon’ lamps, which stand, like sentinels, aside a Mid-century sofa in a silver-grey Pierre Frey fabric, a Studio Van Den Akker coffee table and an updated bergère. “The great potential of the space was its ceiling height”, remembers Jean-Louis, “I designed all interior details to show off the great volumes we created.” A conscious recognition of the room’s vertical and horizontal planes are echoed throughout the space, from the coffered ceiling to motifs and patterns and a careful combination of long and low with tall and reaching. Fresh pale grey continues into the master bedroom which incorporate a slightly more feminine aesthetic with a patina painted fauteuil and a Rachel Hovnanian narcissus giclee print on canvas, ‘Santori I’ – another loan from the living room which also showcases a steel and cast metal piece from the artist entitled ‘Motherboard’. 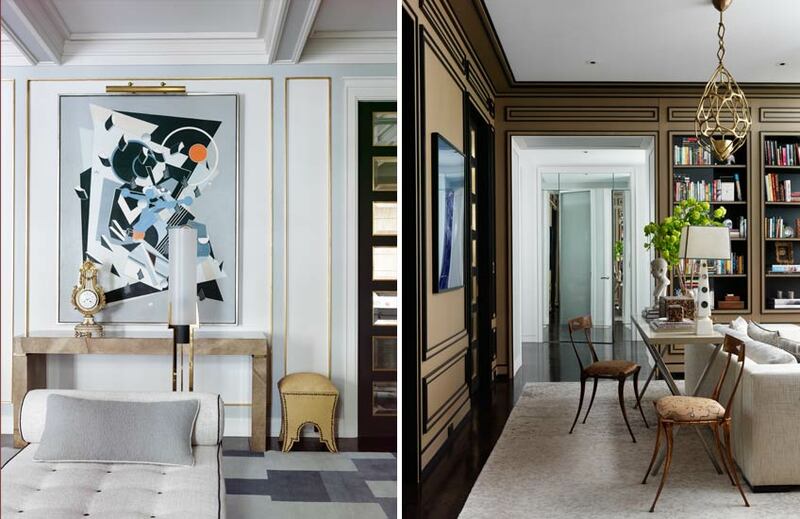 “I wanted to do a cool, chic Fifth Avenue apartment,” Jean-Louis explains of the project, “For me, New York style is the perfect ‎balance between classic American Chic and European elegance and history.” It seems that whether one side of the pond or the other, Jean-Louis’ touch is welcome.